Now you may or may not know, I am a HUGE fan of Christmas, and am always keen to string it out as long as humanly possible! So the other day, a little lightbulb went off in my head and I decided to put together some ideas for a Pinup Advent Calendar! What could be more fun than having something like this to wake up to every day of December?! Bliss! And guess what … you still have time! Just casually forward your significant other the link to this blog post and cross your fingers! Anyway … here are my picks for my ideal Pinup Advent calendar. I’ve tried to do it with a somewhat realistic budget in mind! December 1: seamed stockings – actually, these are seamed pantihose, which is cheating a wee bit if you’re a purist, but if you’re a practical pinup like me, they’re perfect. December 2: a pinup flower – my friend Miss Monique Sweet makes some lovely ones. I do rather fancy a hot pink one like this. Just be careful it’s not too “sticky-outy” when you put it in your hair; it needs to sit relatively flat otherwise you’ll look like you have a garden sprouting out of your head! December 3: a 2015 pinup calendar – I just happen to know of two *insert coy little wink here* … and oh will you look at that? I’m in both of them! 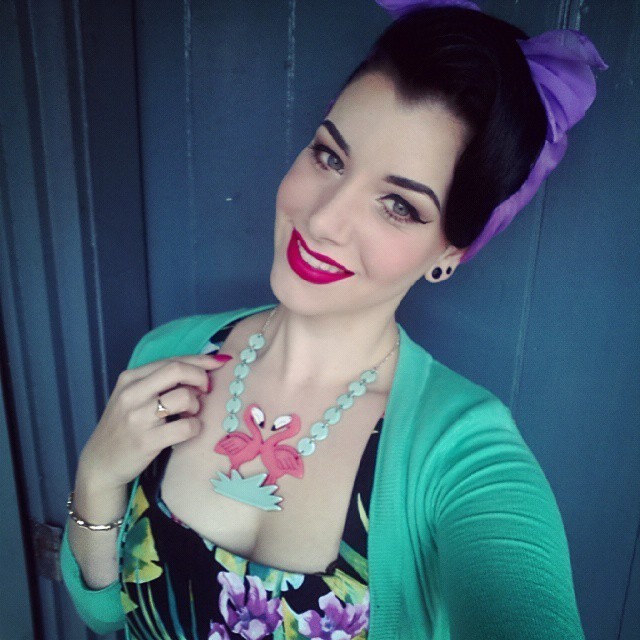 December 4 – cardigan clips – these are gorgeous and are such a cool way to add extra colour or just finish off that cardy or top. These ones are from Pinup Girl Clothing. You can also get them from Pop That Cassette. December 5: a hair scarf – perfect for concealing “bad hair days” but also perfect when you want to accent a good “do” as well! And to add a pop of colour/clash/compliment… the list is endless. This one is from Pinup Girl Clothing. 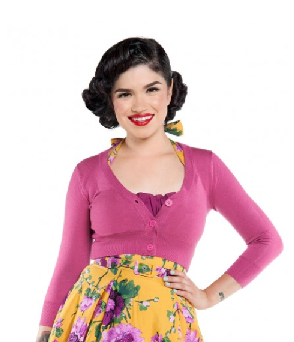 December 6: a crop cardigan – again, from Pinup Girl Clothing, these little crop cardigans are only $18 USD and come in a range of colours. They are the hands-down the best accompaniment to pinup frocks that I know of! 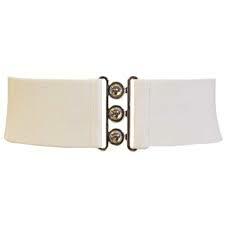 December 7: a wide elastic belt – also known as waist accenters! 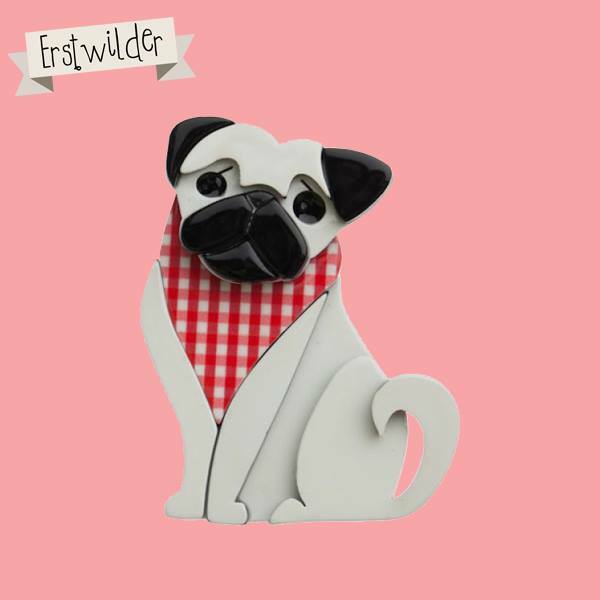 These are pretty cheap and you need them in as many colours as possible … this is a Hell Bunny one. 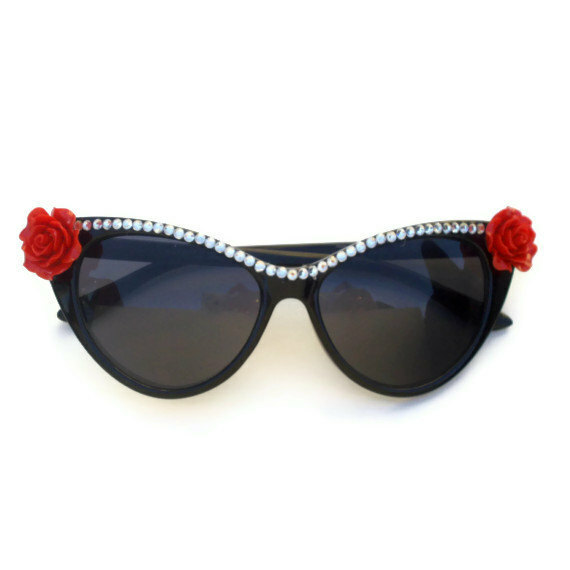 December 8: pinup sunglasses – because really, you can never have too many pairs. And they’re generally not expensive – sometimes as low as $10! These ones are from Etsy. 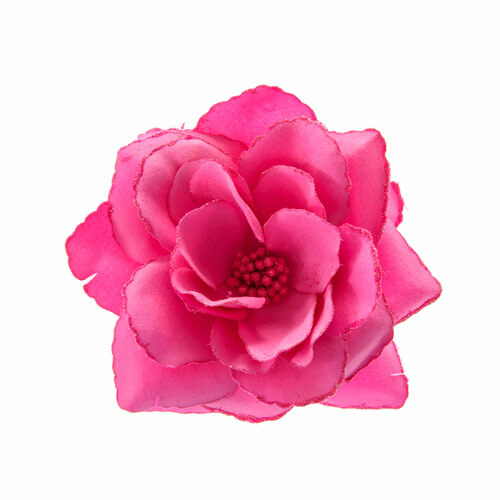 December 10: a brooch – another way to add colour and/or interest to a pinup “ensemble.” This one is from Erstwilder. 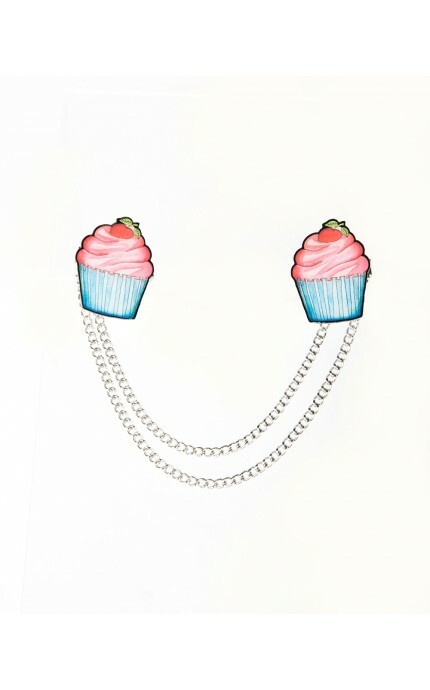 December 11: a necklace – again, a good way to add character and pizazz to an outfit. 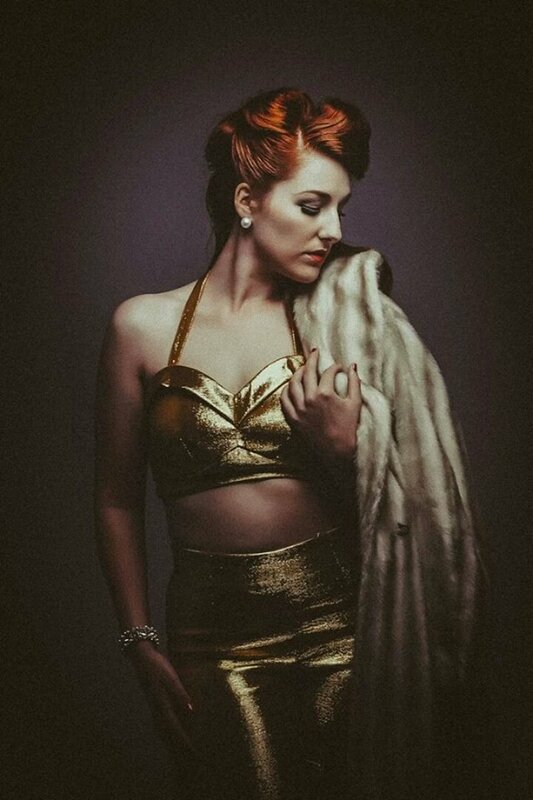 Here’s our very own Miss Victory Violet wearing another Erstwilder creation. 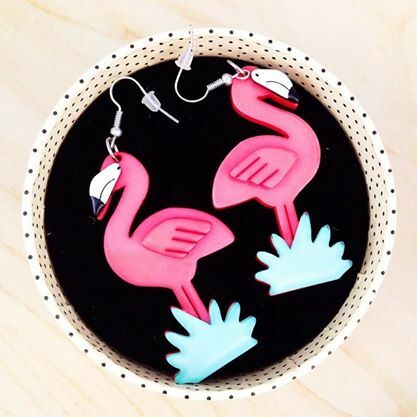 December 12: earrings – same story as the previous two! From Erstwilder. 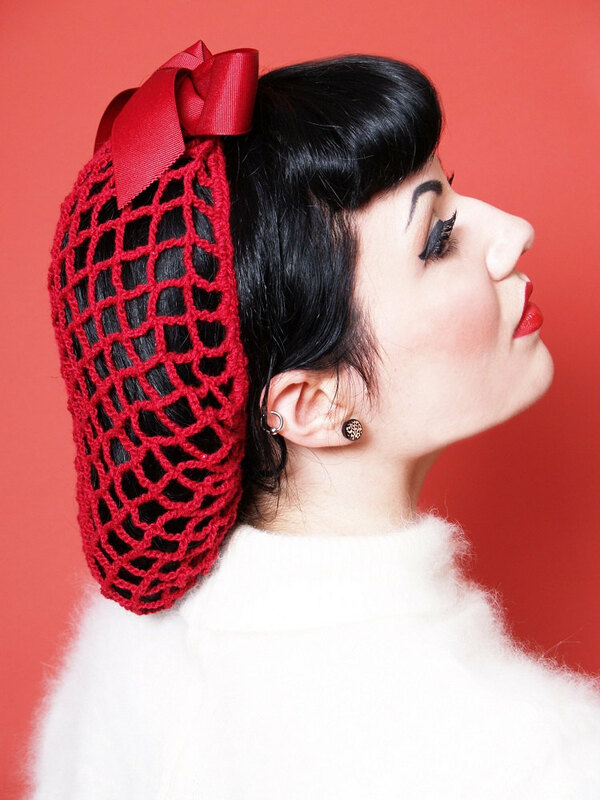 December 13: pinup hairclips – swallow ones are good – or cherries – or skulls! These ones are from Rita Sue. 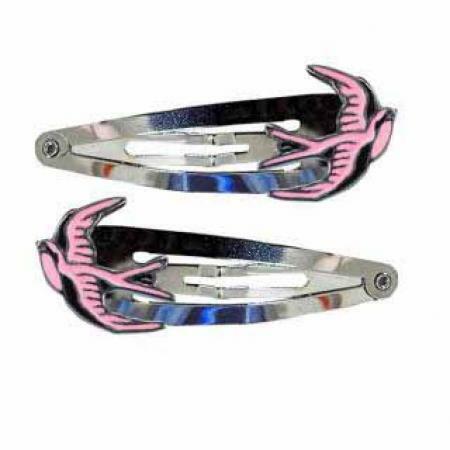 December 14: pin curl clips – essential for a good pin curl set, and most pinups love a good vintage pin curl set, let’s face it! 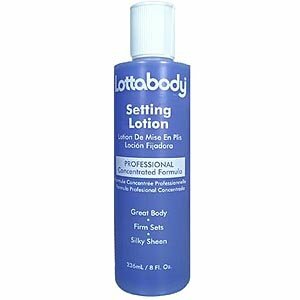 December 15: setting lotion – again, an essential for vintage sets. There are hundreds of different brands … you can’t go too far wrong really. 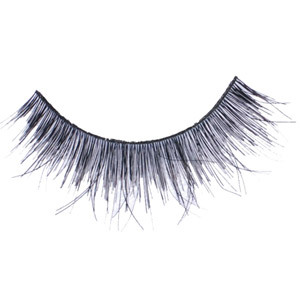 December 16: false eyelashes – pinups LOVE false eyelashes! The best ones I’ve ever found are the Monda Studio Professional wispy and demi-wispy. Once you get over the fact that they’re human hair (eeeeew!!!) 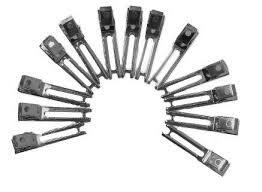 I’m sure you’ll find these the best you’ve ever used too. 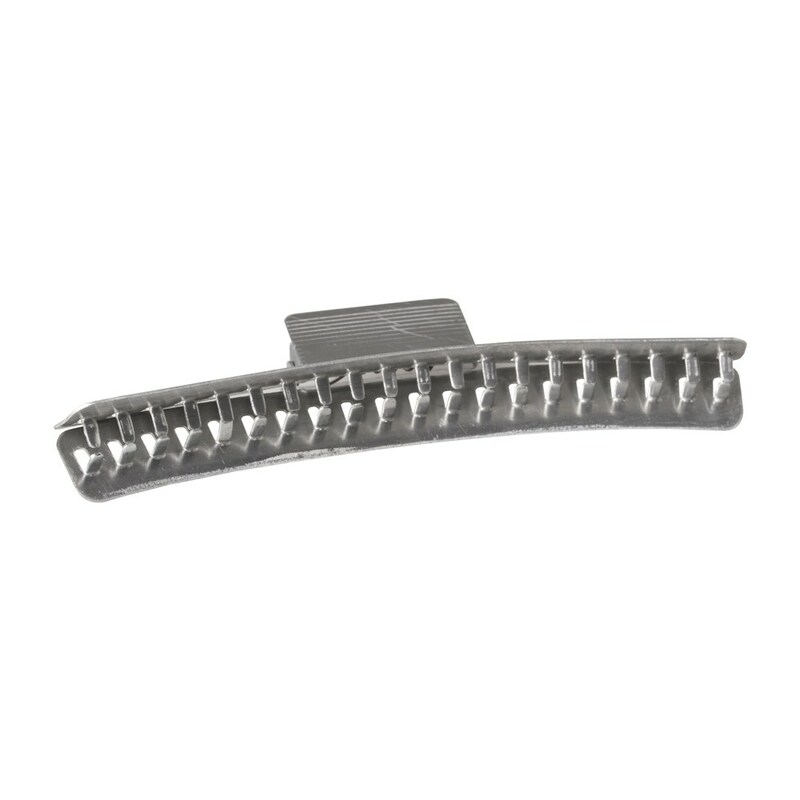 They are SO easy to apply – no struggling and getting frustrated and then having a tant and throwing them in the rubbish ‘cos you can’t get them on! You can get these from Nicola at Blush Baby. 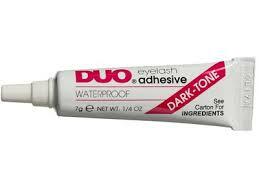 December 17: eyelash adhesive – if you’re gonna buy the eyelashes, you need the adhesive too right?! I prefer black eyelash adhesive, but it doesn’t matter too much. I like the Duo brand personally. Try and get a decent one – this stuff does go VERY close to your eyes after all and I wouldn’t risk using the stuff from the $2 Shop if I were you! December 18: foam rollers – a lot of pinups swear by a foam roller set. 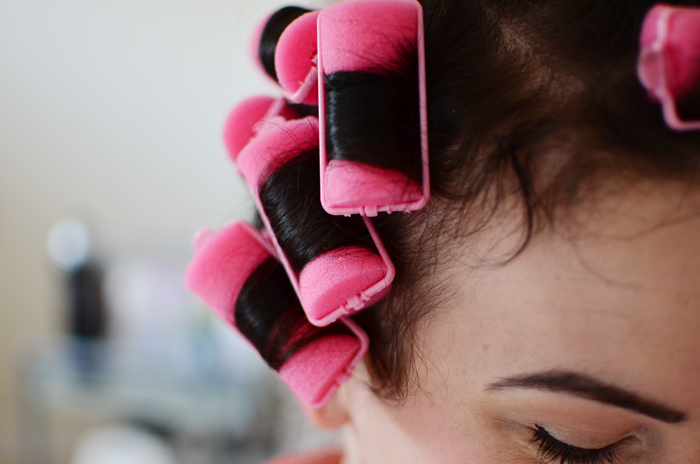 It is renowned for holding the curl and often when you take them out you’ll find you have the FULL POODLE look! I’m told you then brush, and brush, and brush, and brush and brush and – well, you get the picture! 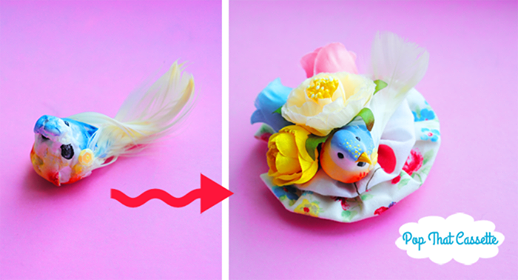 I’ve had no success with them, but that doesn’t mean much – I am not known for my vintage styling skills! 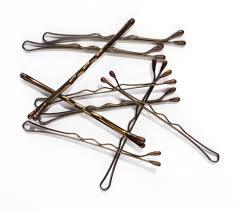 December 19: bobby pins – a pinup can NEVER have too many of these! Varying colours and sizes is good. 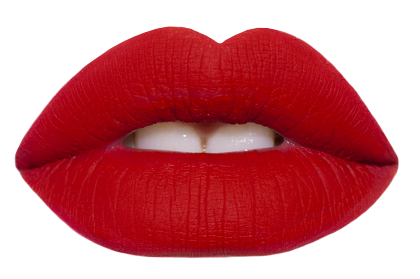 December 20: Lime Crime Velvetine in Red Velvet – I bloody LOVE this stuff – every pinup needs a good red lipstick she can rely on. This stuff is seriously THE BOMB! Read my review here. December 21: a “hair puff” – something decorative in one’s hair is always pretty, and something other than a flower makes a nice change. This particular one is from Pop That Cassette – they can custom-make them for you too – this one was made for Lorelei Louise of True Confessions of a Vintage Addict. So cool. 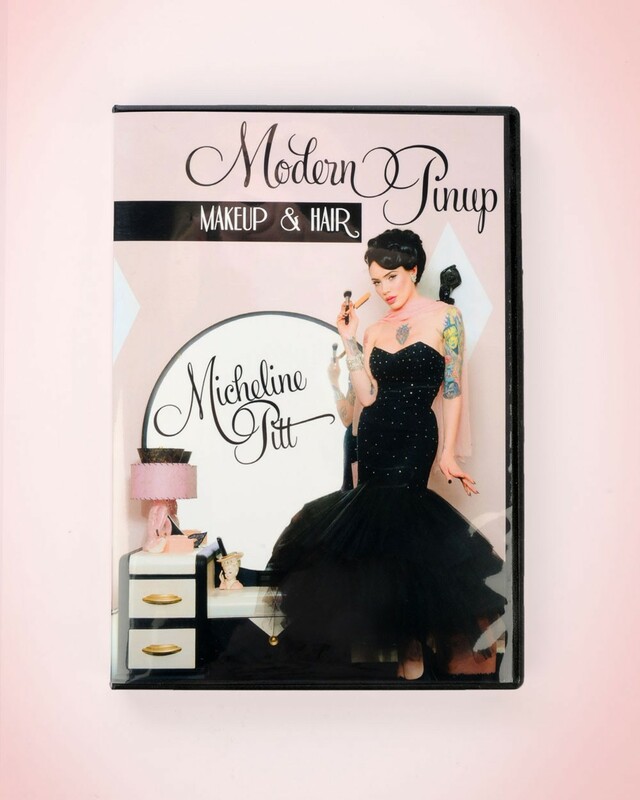 December 22: The Modern Pinup Makeup & Hair DVD by Micheline Pitt – gorgeous tutorials with the gorgeous Micheline! You can get this on Amazon or from Pinup Girl Clothing. December 24: a snood – now I’m not personally a fan of these, although I probably should be because then I wouldn’t have to “do my do” would I?! They do look great on other people though – this one is from Arthelia’s Attic on Etsy. 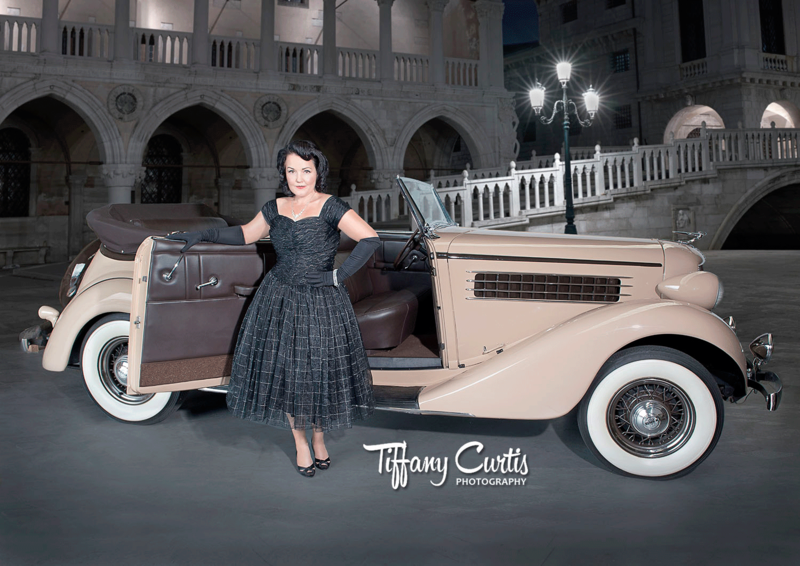 1) A pinup photo shoot – with Tony at Handcrafted Stories, because whoa – he is awesome! Here is a shot he took of my friend, Miss Monique Sweet recently – hot huh! 2) This frock … gorgeous isn’t it?! 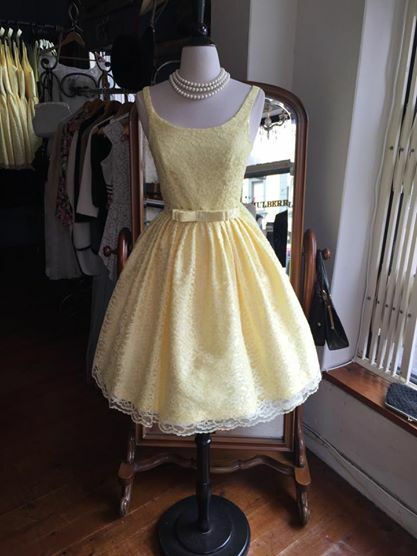 It’s a 1950’s design by Mulberry Street Vintage Boutique. Love, love, love. I would wear it with red accents. Or maybe navy. Or purple. 3) The GHD curler – because meh, all those vintage tools like foam rollers are cool ‘n all, but I’m a modern pinup so I’d much rather go with something quick and easy! This is the GHD Curve Creative Curl Wand – I do want this quite a lot! So there it is … 24 days of pinup Advent excitement! 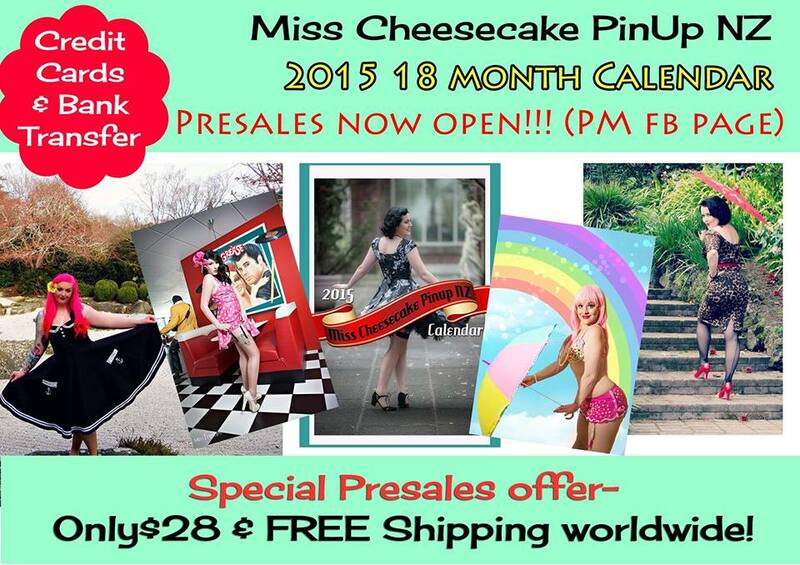 Enjoy making/dreaming up your own Pinup Advent Calendar and then casually leaving your list lying around! Best of luck pinup babies! Posted on November 24, 2014 November 25, 2014 by MumptyStylePosted in Burlesque/PinupTagged Advent Calendar, burlesque, Christmas, pinup.